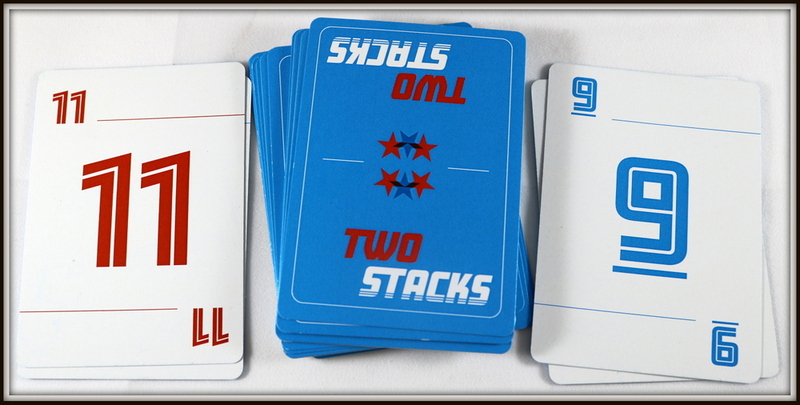 Two Stacks is a cooperative card game where players try to use all their cards together without getting stuck! Each turn, a player can play multiple number cards in consecutive order while also using bridge cards and special cards to jump between numbers. 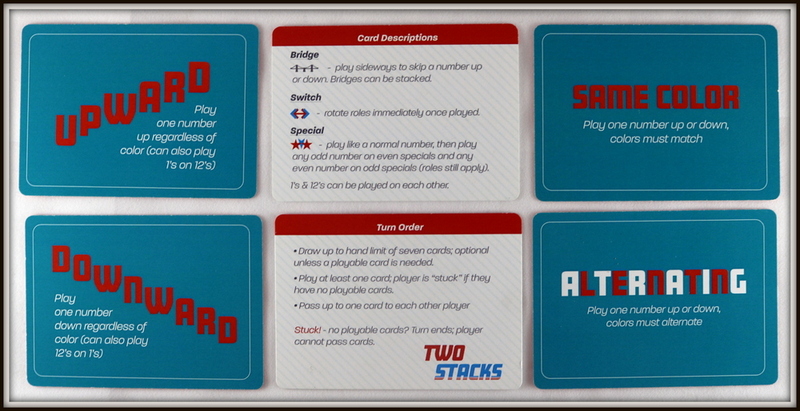 Roles and card colors limit what cards each player can play, so players strategically pass cards to each other to develop winning combinations. Roles also keep players engaged by switching during the game. Each turn consists of three phases: draw, play, pass. Players try to avoid getting stuck with cards they cannot play. If everyone gets stuck, the game is a loss. Players win by playing all of the cards in their hands. 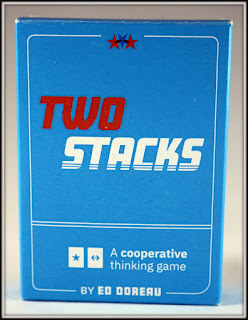 This copy of Two Stacks was provided to me for the purposes of this review, but the opinions here are my own. 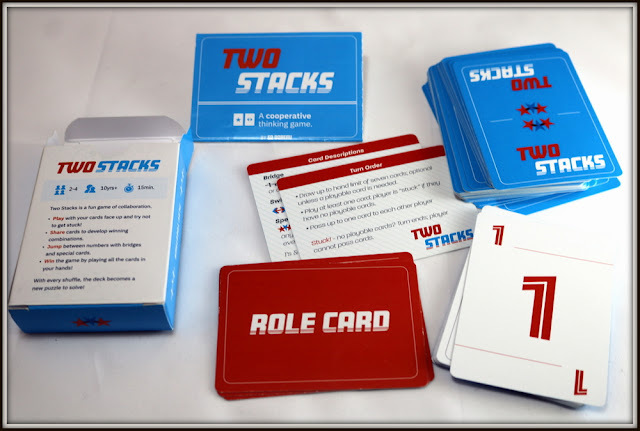 Two Stacks is a speedy, friendly card game where the players collaborate to empty their hands and win! Cards are played from your hand onto either of two stacks in the center of the table, up or down in order, matching or changing color, depending on your particular role in the game. 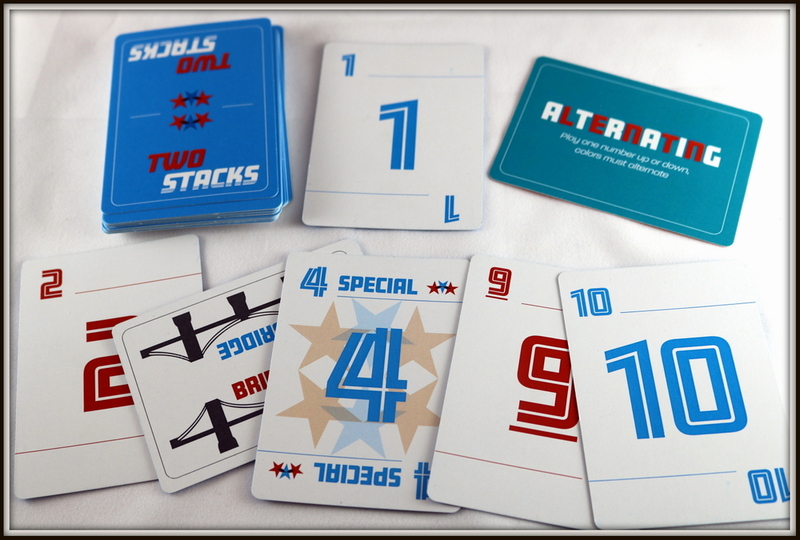 Two Stacks is a compact deck of cards in a tuck box, easy to slip into a purse or bag for on-the-go games. 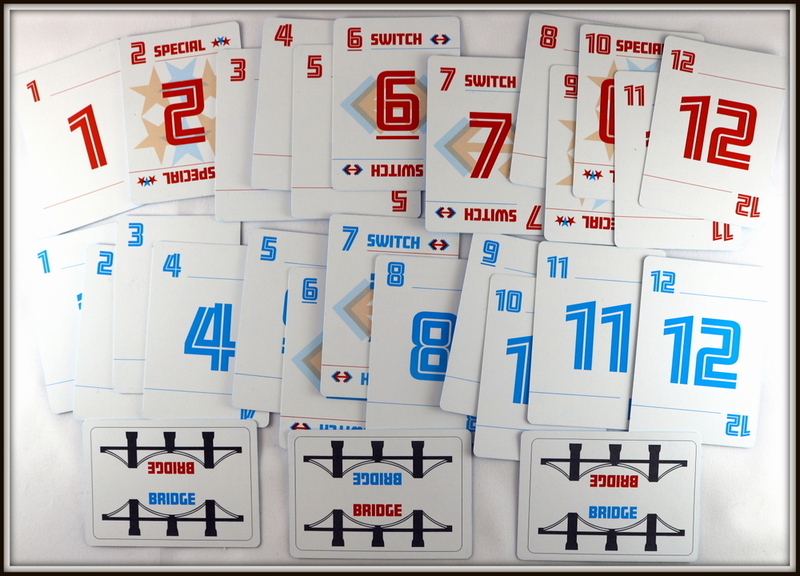 The deck includes two each of the numbers 1-12 in blue and in red (for a total of 48 number cards) plus 12 bridge cards which can be used or partly removed to make the game more challenging. In addition, there are two player aid cards, four role cards, and an instruction sheet. The instructions are quick to read and the game is fairly easy to teach. 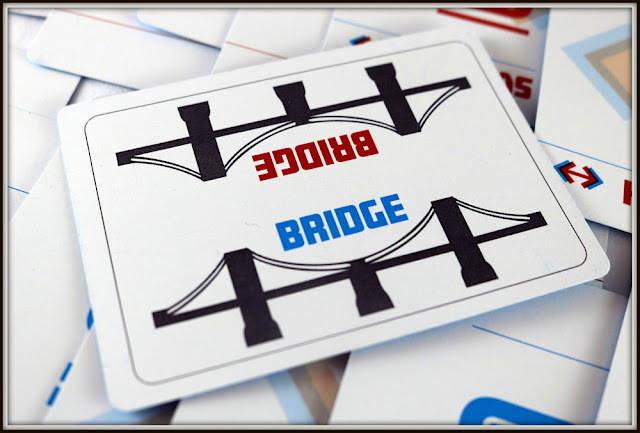 To set up, choose your player count and difficulty level, and look at the table in the instructions to determine how many bridge cards to shuffle into the deck of number cards. 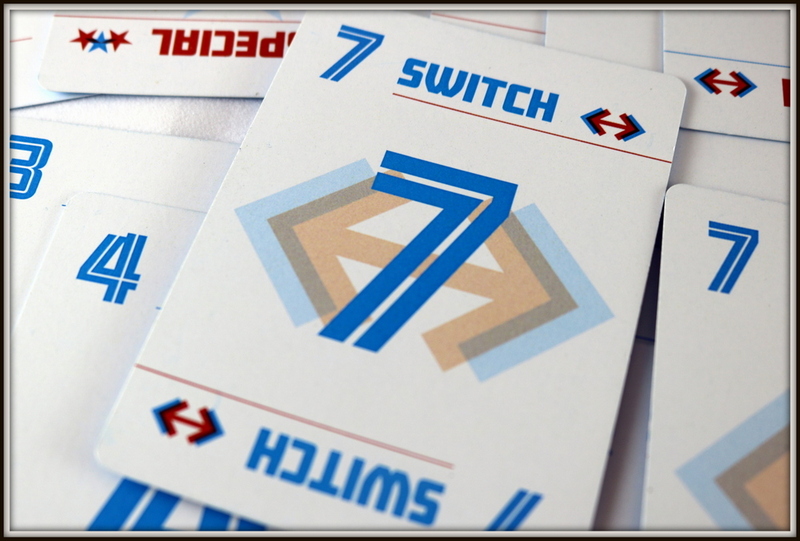 Each player starts with four number cards in hand, and two cards are flipped up into the middle to start the Two Stacks. You're ready to play! 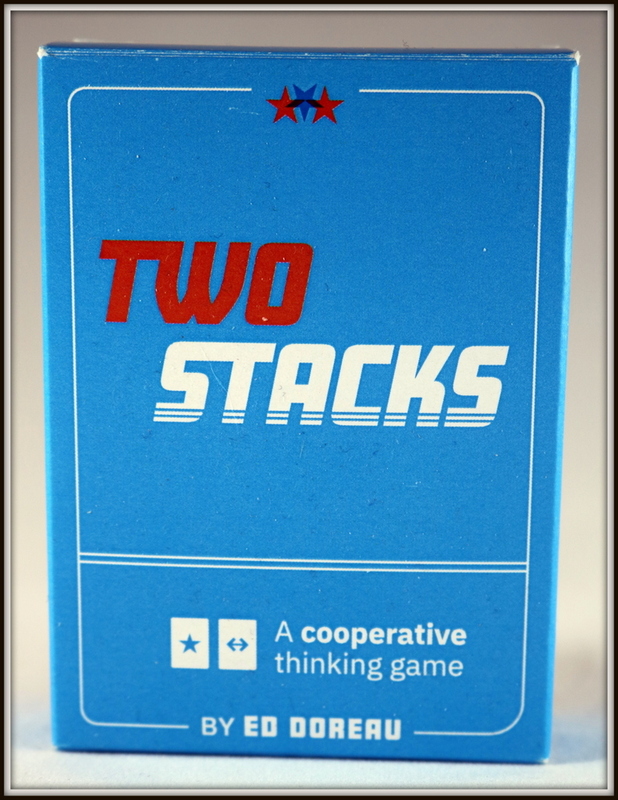 Two Stacks is a cooperative game, so you can choose to play with your hand of cards showing on the table or kept hidden. Starting with your hand showing is a good way to teach new players or give younger players a little bit of extra help. Drawing cards at the beginning of your turn is sometimes necessary, especially if you don't have anything in your hand you can play. It's important to balance drawing enough cards without drawing too many since your goal is to have all players run out of cards in hand. The play phase is the main part of your turn. You'll need to add at least one card to one of the stacks in the middle of the table. Cards can go up or down (and you can flip from 12 back to 1 or 1 around to 12). Bridge cards let you skip a number (go from 3 to Bridge to 5), and can be doubled or even tripled to skip several numbers in a row. Each player also has a role card. In a four-player game, one player can only play the same color (red 6 on red 7), while another must alternate colors (blue 3 on red 2). The third player can only play downward, regardless of color, and the last player can only play upward. This limits what you can do with your hand, and makes the option of passing one card to each other player at the end of your turn extra important. But wait! Just when you get into the rhythm of your role, someone will play a 6 or a 7, which are Switch cards--now everyone passes their role to the player next to them, and you have a new role controlling your plays. 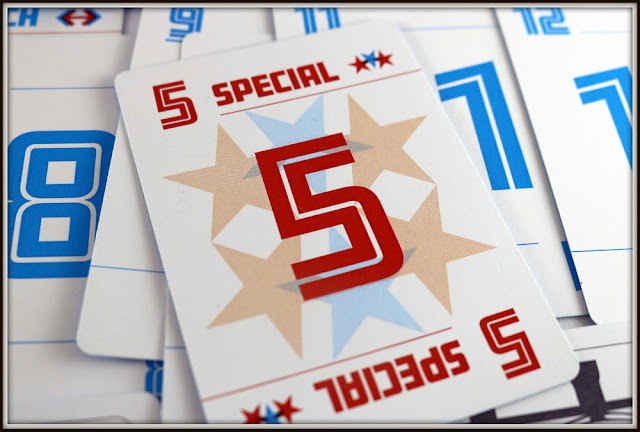 There are also special cards, marked with stars, that give you a little extra breathing room--any odd number can be played on an even special card, and vice versa. 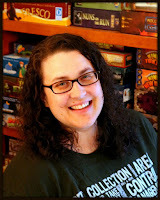 Continue to draw, play, and pass until either everyone is stuck and unable to play, in which case you lose, or until all players have run out of cards in hand, in which case you win! Two Stacks is easy to learn and teach, and very quick to play. It makes a good filler game between other games or a waiting room game when you're on-the-go. My family loves cooperative games, and so we really appreciated being able to work together to solve this puzzle as a team. The cards are easy for us to read, although I would love to see color-specific symbols added to make the game colorblind friendly, too. As a homeschooling and gameschooling mom, I appreciated the opportunity to use Two Stacks as a fun way to help my kids learn strategy, number sense, probability, and more. My two small comments, besides the colorblind issue above, were that I don't like tuckboxes (they degrade very quickly, though I know they're a less-expensive option) and that I would have re-ordered the instruction sheet to put the gameplay flow before the specific card uses. In such a short instruction book, though, that wasn't a huge issue--I simply flipped back over to re-read the card types after I understood the flow of the game. This is a great game for families who like other cooperative number games, like The Game or The Mind but find those close-handed games a little difficult for the younger members of their family. 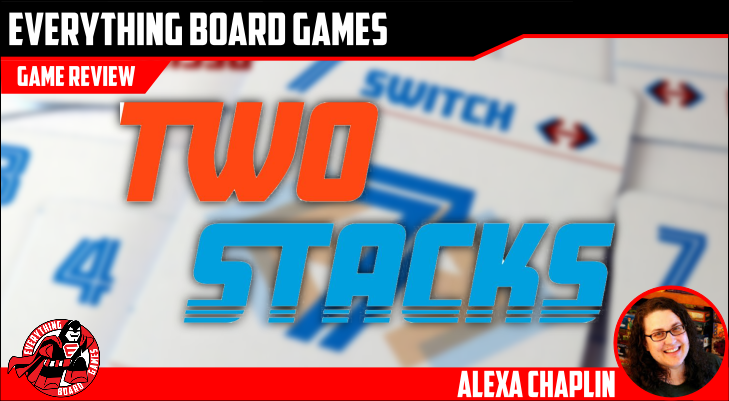 Two Stacks is a lightly strategic game where you get to play as a cooperative team to puzzle out the best way to play your number cards and beat the deck. Its compact size and quick play time make it a great on-the-go game for families, and an excellent addition to our gameschooling day.